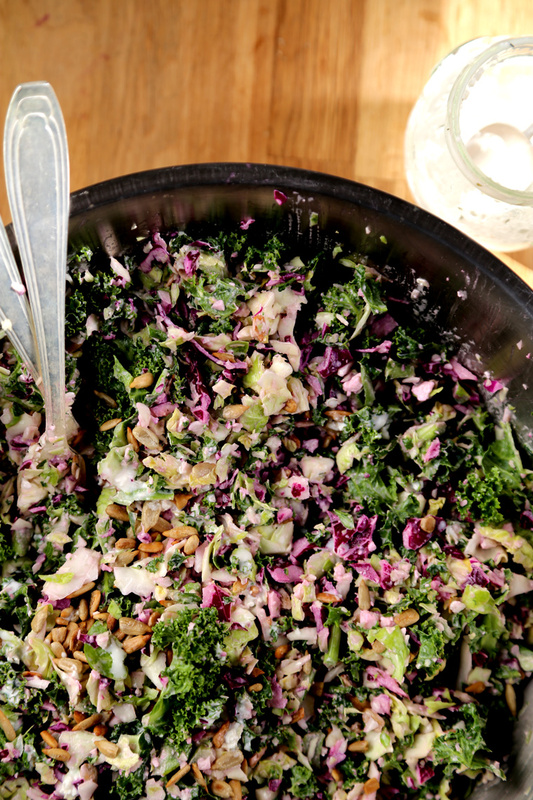 I’m sending winter on it’s way with this fresh crunchy slaw. 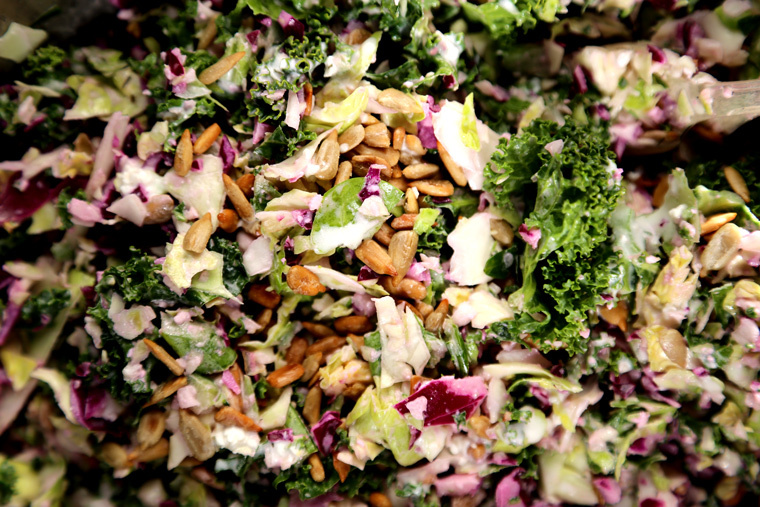 A cruciferous confetti party to celebrate the beginning of a new season. I got the idea for this salad from my neighborhood grocery store. They were giving out samples from a mixed bag of winter greens and topping it with a greek style feta dressing. It was good but I wanted to try and make it better. Mission accomplished – this dressing is the best. Chunks of salty feta with creamy crème fraîche, a bit of tang from some yogurt and bright lemony zest – much better than the bottled version. This is the kinda salad you just eat standing over the kitchen counter. I didn’t even bother putting it on a plate – just ate it straight out of the bowl. My mom says if you keep trying something that means it’s good. I kept trying bite after bite, you know – just to be sure it was good enough to share with you all. 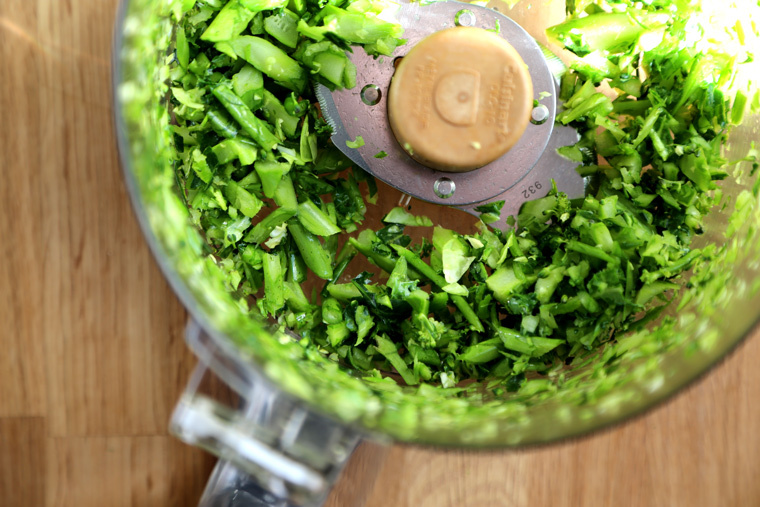 Chop the broccoli by pulsing it in your food processor a couple times. Do this with the rest of the ingredients. 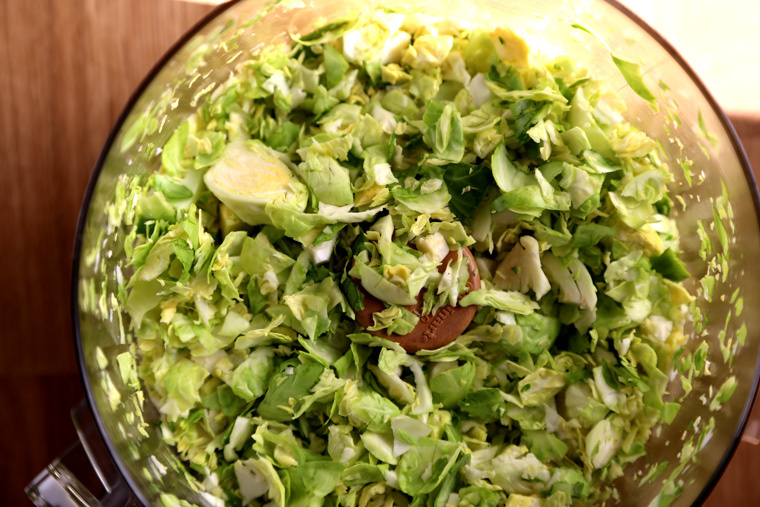 Shred the brussels sprouts by pulsing in your food processor a couple times. Shred the rest of the ingredients like this, working in batches. 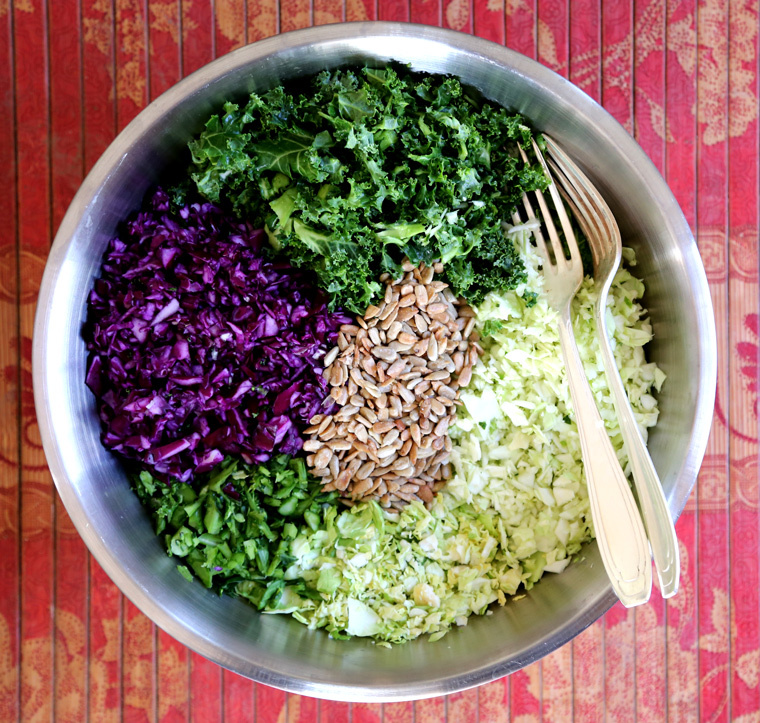 Place all ingredients for the slaw in a large bowl. Combine all the ingredients for the dressing in a large jar with a lid and shake it all up. 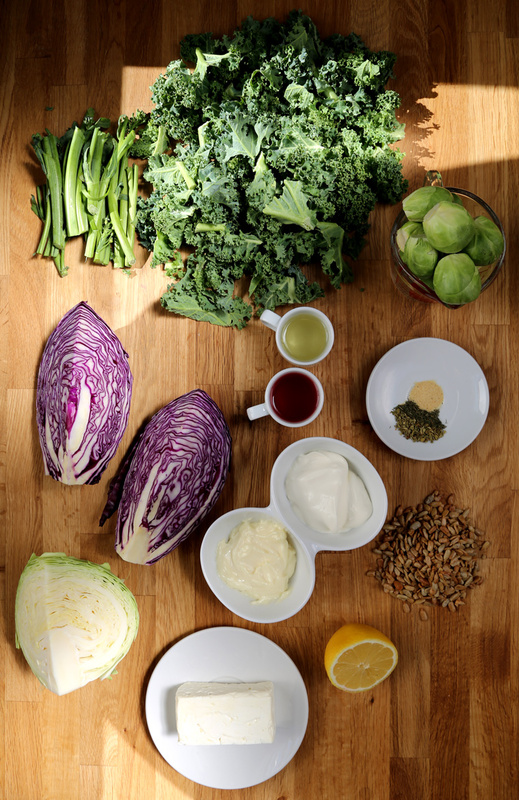 Combine all the ingredients for the dressing in a large jar with a lid and shake it up to combine. 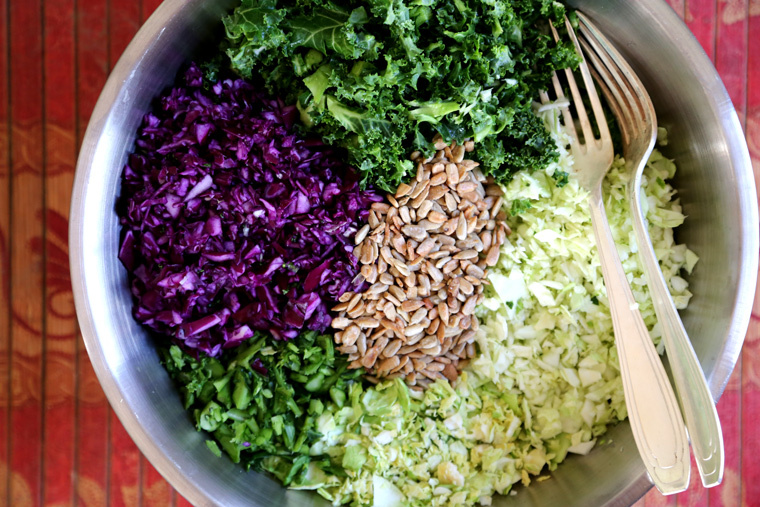 Working in batches, shred the ingredients for the slaw in your food processor or finely chop by hand. Place all the ingredients in a bowl and add the sunflower seeds. Toss with dressing and some fresh ground pepper. I prepped this recipe last night and tossed everything together with the dressing tonight. What a beautiful dish! My family enjoyed it. I added honey to the dressing to cut the tart a bit (there’s a kid I need to consider). Next time I plan to be sure to use salted, roasted sunflower seeds instead of raw and I plan to toss in a cup of dried fruit…maybe cranberries for the color. Thanks for the inspiration! I’ve divided the leftovers among some mason jars so I can enjoy the salad for lunch this week. Thank you so much for your comment Julie! 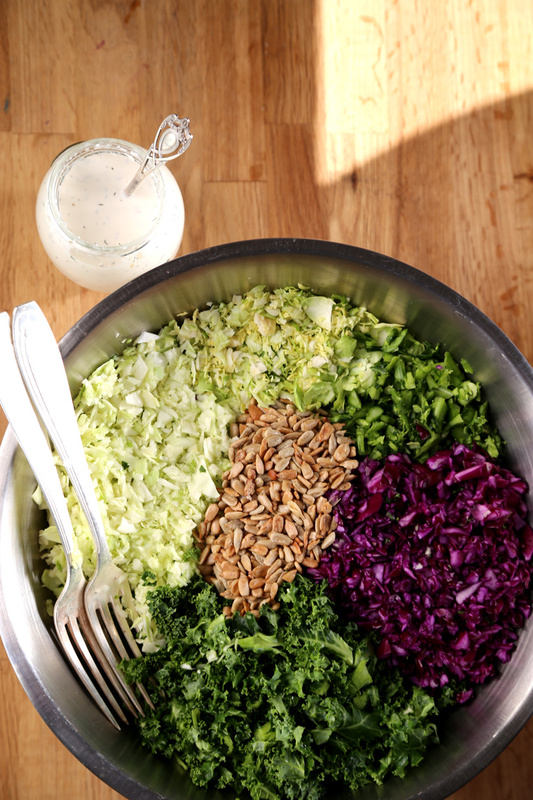 Your addition of honey to the dressing sounds delicious – as well as the cranberries! I will have to make this again and try your suggestions. I’m glad you enjoyed it! what a lovely dish my dear!!! Everything I love in one giant bowl. The dressing sounds fantastic! Thanks so much Andrea! Have a wonderful weekend! Grace! This looks amazing! I can’t wait to try this. Thanks so much. Your ingredient photos are awesome! Thank you so much Mandy!